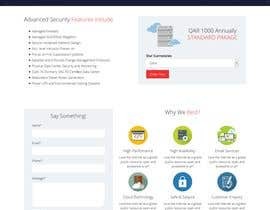 We are offering cloud web hosting and we need to design a responsive and very professional landing page for our Google AdWords and Facebook marketing campaign. Use the attached product brochure to get details about our product. 3. Call of action should be Order Now and Contact Our Sales form (Name,Email,Phone) –PHP mailing function should be included. 5. Once your design wins the contest, you need to provide the landing page with six different currencies and contact number to target six countries. Note: Final Output Should be on HTML or with PHP code as it's using for PHP mailing function. Hi CH.. this is the landing page for your website or only for AdWords / marketing campaigns?? Dear Sir, I submit my Entry. My Entry No#25. Please Check my Entry. We like the landing page demo provided by Sonia, But it has to be drafted with our content. Not just copy past. Thanks for like to my demo . Give me 2 days i will be make new creative website layout . Sonia provided a theme from Themeforest...It's not a unique design at all. Appon is a copyrighted theme from Themeforest. All details including images and logo provided in the attached PDF. Seems non of you looking into this. 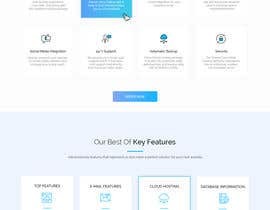 This contest is not just about the design, We are looking how you are putting our product highlights in the landing page in attractive way with impressive design. Non of the entry is drafted using our content that we provided. Kindly #sealed for independent ideas. Or PHP as mail function is there for sales contact form. Are you want to need the landing page PSD format. ?